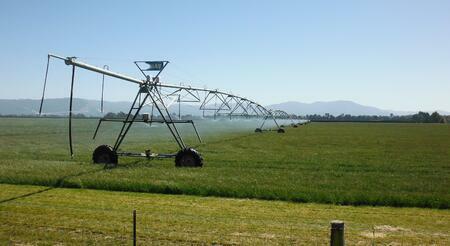 Robindale operates two giant centre pivot irrigators, each covering a 1.1 mile circle of prime pasture and taking 32 hours to complete one circuit. The irrigation system is fed by two bores which draw water from 525 feet underground, using 230 kW submersible pumps. When an irrigator is started, a soft starter activates the first 230 kW pump and water starts to fill the mainline and pivot. After 5 minutes the second pump, 3280 feet away, also starts, helping to fill the mainline and build system pressure. Both pumps are soft-started using AuCom's advanced Torque Control feature, which minimizes pressure surges during starting. This ensures a smoother, more linear acceleration to full speed. The system was designed and commissioned by Gary Roxburgh of Nairn Electrical. Gary has installed hundreds of soft starters into irrigation systems since 1991, and he prefers to use AuCom products because of the advanced features which ensure safe and trouble-free operation of the system. Torque control soft starting provides near-linear acceleration during starting, eliminating pressure surges and mechanical stress. Pump control soft stopping prevents water hammer, extending the life of pipework and reducing the need for maintenance. A low pressure switch wired to the starter's programmable input monitors pressure levels once the mainline has filled and allows the starter to stop the pump if it detects a loss of pressure during operation. Programmable relay outputs are used to activate variable speed drives, which operate booster pumps on the surface. The soft starter-drive combination keeps pressure constant throughout start and operation, even when the irrigators move across varying terrain. User-programmable electronic shearpin and undercurrent protection provide customizable defence against problems including broken pipes or faulty valves. This protection is built into the IMS2, eliminating the need for additional relays, indicators and wiring. The easy-to-read feedback display provides comprehensive status information on inputs, outputs and motor operation, without extra costly interface displays. The adjustable busbar configuration of larger IMS2 soft starters simplifies cabinet design, reducing installation costs. Robindale is one of New Zealand's largest dairy farms, and demands the highest standards of reliability. "With pumps of this size it was important to get it right," says Gary. "We needed a tailored solution from a company with a commitment to back-up and service. The AuCom starters give us all the benefits of using motor controls from a specialist in the field."